ABOUT US - Website of gsd2000! GSD 2000 was formed in October 1999 and gained registered charity status in January 2000, hence the name GSD 2000. 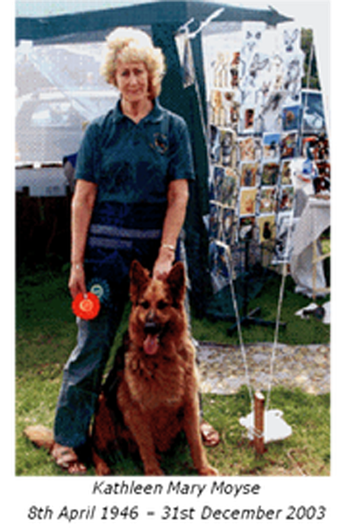 Before then, the founding members of the Charity were volunteers for another West Country German Shepherd rescue but, unhappy with the way that rescue was run, felt they could do very much better on their own to help unwanted, abandoned or badly-treated Shepherds. enthusiasm enabled us to have our own charity shop. on doing what she liked best - working in the shop and promoting the Charity. shop but also in her enthusiasm and love for the dogs. Holsworthy Vintage Rally in June 2003. Kathy was always the leading light of GSD 2000, and we must ensure the flame is never allowed to fade. In January 2006, long-time Member Steve Hamblyn became Chairman, with his wife Julie becoming a Trustee. They held these positions for over 10 years before they both felt it was time to step down and hand over to someone else. Their commitment to the Charity, and what they have contributed has been invaluable. They have fostered countless dogs, some for just a day or two, but mostly they have cared for our long-term "problem" dogs. Some of these dogs stayed for months at a time, and it is because of their efforts that these dogs have been socialised and made well and truly fit to re-home. Their kindness and generosity has given these "problem" dogs a second chance they otherwise wouldn't have had. The Charity has also benefited from the use of their land, where we have held nine of our annual dog shows - huge events involving an incredible amount of time and effort on their part - not to mention the Christmas and Easter Fairs they have hosted. Steve and Julie officially stepped down at our AGM in August 2015, but continue to be Members and help out whenever they can. We can only say THANK YOU for all they have done.